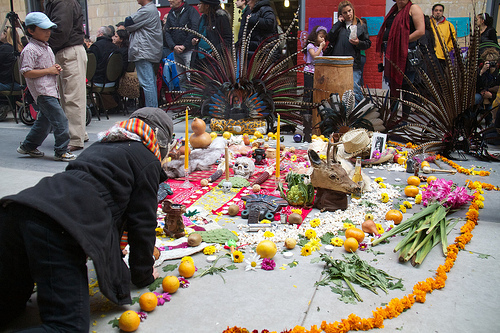 On Halloween we checked out Wychwood Barns for a small Dia de los muertos celebration (Day of the Dead). 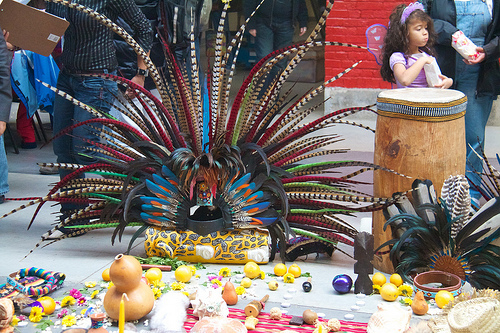 There was all kinds of Mexican food being prepared, crafts for sale, performances and an altar being built. 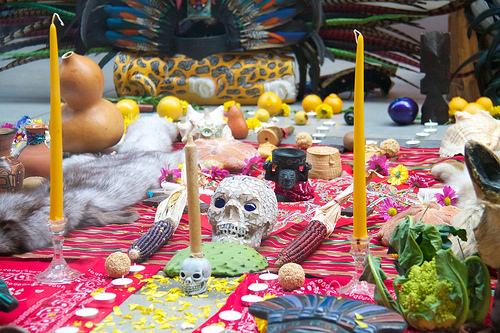 There was a wide range of people there, and they were burning a smudge incense in the altar. Unfortunately, Chris was catching a cold and found the incense too powerful for us to stay long, but we enjoyed the brief visit all the same. 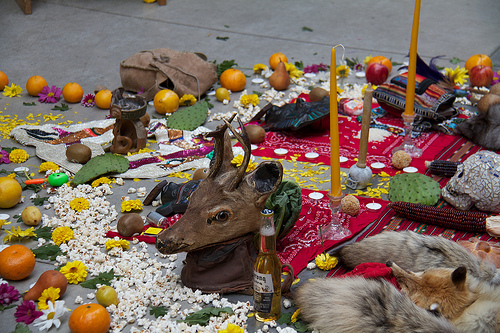 The altar was fascinating, especially the Aztec headdresses, which presumably were to be worn later in a performance. I picked up some papel picado to decorate with at home. Papel picado are the intricate tissue paper banner designs that are used to decorate in Mexico, not just for Dia de los muertos, but all kinds of celebrations. Chris and I have been taking advantage of the fairly decent weather today to deal with the remaining autumn yard work tasks. I needed to clip back some of the dead foliage on my perennials and of course the leaves from our giant oak tree just never end. Chris is wiring up a new light in the garage; all we had before was a naked little bulb dangling at one end. He’s putting in an 8 foot fixture that will hold fluorescent tubes. We’re also planning to add some insulation to the attic, so he’s taking advantage of needing to go up there anyway to wire in some lighting in other parts of the house. I don’t think we’ll get to the insulation part this weekend though (as always, the home renos take at least twice as long as you think they will). We’re going to use the blow-in insulation and we need good weather to run the machine outdoors, and tomorrow is supposed to rain. I get to feed the bales to the machine while he crawls around up there. All I can say is I’m really glad I don’t have to go up there — I definitely get the better deal there. Next weekend is likely a write-off for us though, so we’ll see — we need to do it before the weather gets beyond cooperation.